“Higher FDI than what existed till now will directly boost the overall scenario in the country, besides generating lakhs of new jobs, This will add to the nation's GDP." 8th ELASIA- 2019 Exhibition will be the podium to compare the best in the world to the best in India. The show will constitute an ideal platform not just for maximum exposure of cutting-edge products & services to key Electrical, Electronics, Lightings & Power sector players and top decision-makers but also for the kind of high-powered faceto- face business meetings and contacts that will take an Organisation forward in leaps and strides. Everyone who is anyone in the Electrical, Lighting & Power world is going to be at this exhibition. Starting from Manufactures, OEM's, Suppliers & Distributors, to agents anad manufacturers. They are going to be consolidating brand image, exploring & expanding niche markets, establishing contacts and initiating deals. Be a part of this excitement, participate in an unique opportunity seizing event - 8th ELASIA 2019. Triune Exhibitors Pvt. Ltd (TEPL) was founded in 2000. TEPL’s core business is organizing Exhibitions and Conferences etc. The group acts as an interface between government, industry, media and academia. TEPL is amongst few Indian exhibition organizers with a commendable track record of having organised 46 Exhibitions on various subjects like Machine Tools, Electricity, Plastics, Printing & Packaging, Food-pro & Hospitality etc. 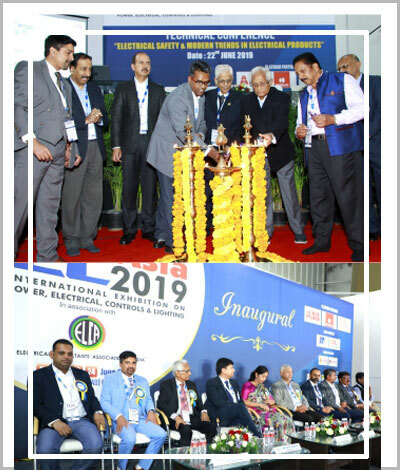 The Electrical Consultant’s Association (ELCA) was founded and registered in 1990 at Bangalore by a group of dedicated consulting professionals actively involved in the field of electrical consultancy. To take up such technical aspects with the statutory authorities as are relevant for a proper and safe installation, considering the present trends in the design of the systems and development of electrical products. Copyright © 2018 8th Elasia. All rights reserved.